Was it a ship’s flare or a meteor? It appeared at almost exactly 11 p.m. Monday while I was standing in my living room talking with Nina Howard of Inverness. Suddenly a bright-white light came into view out my window, traveling west to east in the moonlit sky. “Turn around quick!” I said to Nina, who did and was able to see the end of the light’s long arc as it disappeared behind Inverness Ridge roughly three miles south of my cabin. The light appeared to have been high above the ridge with a long trajectory. I called the Sheriff’s Office and reported that two of us had just witnessed what appeared to be either a ship’s flare or a meteor. About 10 minutes after I hung up, I got a call from the Coast Guard in Bodega Bay. An officer asked several questions and then requested I stick around the cabin for a followup call. After a few more minutes went by, I received a call from a woman who identified herself as a member of the Coast Guard in San Francisco. She was clearly well versed in making sense out of what civilians report. Given that the light was visible longer than a typical shooting star, she felt there was a reasonable chance it was a ship’s flare. After a few more questions, she said I’d provided enough information that she could organize a search, adding that the Coast Guard appreciated my reporting what I’d seen. Tuesday morning I checked with the Sheriff’s Office and the Coast Guard, but neither reported finding any boat in distress, so I called the Morrison Planetarium in San Francisco. Bing Quok, the assistant director, said there was a “possibility” that what I saw was an “early meteor” in an annual meteor shower known as the June Boötids. The Boötids are normally seen from June 26 until July 2 and will peak this Wednesday night, June 27, an hour and a half before sunset. 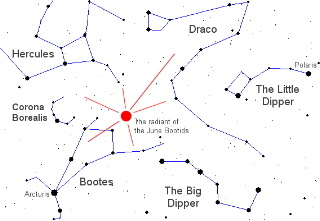 The typical shower lasts for several hours, appearing to radiate out from the constellation Boötes (hence the name), which is near the end of the handle of the Big Dipper. Boötes will be directly overhead at the peak of the shower. This map of the constellations comes from the website of Spaceweather PHONE, an unusual enterprise that for $4.95 a month will give you a phone call every time meteor showers, Northern Lights, space-station flybys, planets in alignment etc. can be seen from where you live. The June Boötids are debris from the comet 7P/Pons-Winnecke, which is named after Jean Louis Pons, a French astronomer who in 1819 first recorded a sighting, and a German astronomer named Friedrich August Theodor Winnecke, who rediscovered the comet in 1858. The comet normally produces a weak meteor shower, and nothing at all was seen in 1880, 1904, and 1957. However, in 1916, 1921, 1927, and 1998, it produced dramatic showers. In 1998, some 100 meteors an hour streamed from the comet for seven hours straight. By meteor standards, the Boötids travel slowly, only 40,000 miles per hour (11 miles per second). The light I saw was visible through my window for two to three seconds; if it was indeed a Boötid, I first saw the meteor about three seconds after it entered the earth’s atmosphere, the edge of which is 62 miles above us. Astronomers, by the way, believe that although meteors primarily come from asteroids (AKA minor planets), they also from comets, the moon, and Mars. Any solid body coming from outer space is called a meteoroid — if it’s at least as large as a speck of dust but is smaller that an asteroid. If we can see it, we call it a meteor, and when a meteor makes it to earth at least partially intact, we call it a meteorite. The meteorites that come from Mars and the moon (more than 20 of each have been found) probably were thrown into outer space when an asteroid slammed into those heavenly bodies. Although a huge amount of meteoroids (a total of more than 100 tons) supposedly enter our atmosphere daily, most are well under an inch in diameter. And most are traveling so fast (up to 45 miles per second) that they slow down and burn up as a result of atmospheric friction. In 1908, a meteoroid believed to have been a 200-foot-wide bundle of stones slammed down on a remote region of Siberia north of Mongolia. Although it disintegrated before hitting the ground, its airburst leveled trees in a 30-mile-wide area and was heard all the way to London. Scientists have, in fact, calculated how much damage can be expected from different sized meteors. 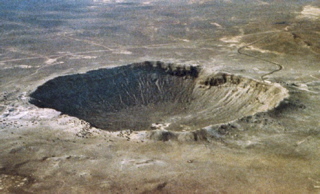 A meteor less than 165 feet in diameter will usually burn up in the upper atmosphere; stone meteors 245 feet in diameter have the impact of the Siberian meteor while iron meteors that big create craters the size of Winslow, Arizona’s, but meteors this size come along only once in a thousand years. Every 5,000 years on average, a meteor 525 feet in diameter devastates an area the size New York City while every 63,000 or so years, meteors roughly 3,000 feet in diameter show up and lay waste to areas the size of Virginia. And every 250,000 years a mile-wide meteor strikes the earth and wipes out an area the size of California or France. An asteroid capable of killing off the dinosaurs drops in every 100 million years. Fortunately, the Boötids won’t do anything like that; nonetheless, it’s probably worth watching the sky as soon as it gets dark the next few nights — even if the light Nina and I saw Monday was actually a ship’s flare. However, Café Reyes owner Robert Harvel told me Tuesday night he had seen a similar light race across the sky about 10 p.m. Monday, making me now suspect that both lights were part of the same meteor shower. 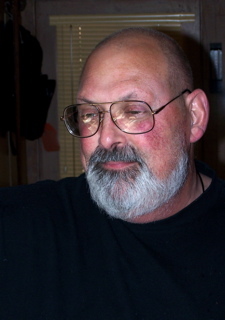 Inverness resident Andrew M. Schultz died on Monday, June 18, at the age of 58 from complications related to small-cell lung cancer. Andrew’s specialty was selling newspaper classified advertising to automobile dealerships, which he did almost continually for more than 30 years. Born in Manhattan, New York, on July 27, 1948, to Fran and Leon Schultz, he attended public schools in the Bronx, Plainview, and Long Island, as well as Hofstra University on Long Island for two years. For two years he studied to become a chef only to switch courses and attend two more years of classes at the New York Institute of Photography. Many may have sent or received the composite postcard from Inverness with photos of downtown, a friendly pelican and the famous beached boatwreck. All those photos were taken by Andrew Schultz. Another of Andrew’s favorite photo assignments has been the annual Disaster Council pancake breakfast at the Point Reyes Station firehouse. Andrew said he enjoyed capturing on film the pillars of the community stuffing their faces with pancakes. “In 1972,” he recounted, “I went to work for The Funfinder as a photographer but quickly became a salesman. In those days, The Funfinder was an entertainment periodical the size of TV Guide, boasting a circulation of 20,000 in San Francisco and Marin counties. When The Marin Independent Journal bought The Funfinder in 1975, Andrew went to work for The Independent Journal. “The most fun I’ve ever had was selling automotive classified when I moved from The Funfinder to The IJ,” he recalled. “It was one of the most interesting changes I made in my work life. It clicked, and I just loved it. 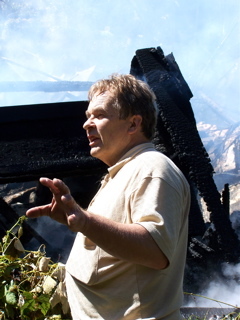 After moving back to Marin County, Andrew sold advertising at The Point Reyes Light for a year, at the Petaluma office of a free “pennysaver” owned by newspaper chain publisher Dean Lesher, at The Petaluma Argus Courier, The Cotati Times, The Press Democrat in Santa Rosa, and Auto Trader in Petaluma. Indeed, Andrew sold advertising space wherever he could find it, whether it was on cash register tapes or the community-access channel of Horizon Cable. In 1999 after public-utility deregulation, he even tried to sell electricity and was hopeful of signing up most of California’s schools. However, the company he was working for collapsed. Many West Marin residents knew Andrew as an advertising salesman and operator of Horizon Cable’s community channel, Channel 47. As such, Andrew donated a good portion of his time to helping the local nonprofits with their fundraising. West Marin had enjoyed good television reception until 1973 when Bay Area channels stopped transmitting from Mount San Bruno and began using the newly constructed Sutro Tower. TV signals to this stretch of coast were then blocked by Mount Tamalpais. Among those unhappy with the resulting poor reception was Andrew. The poor reception also prompted John Robbins, formerly of Inverness, to build the West Marin Cable system, starting in 1983; he sold it to Horizon Cable in 1991. Even after the cable system was built and sold to Horizon, Andrew continued in his spare time to sell advertising for its community-access channel, which was then Channel 11 and 13 and is now Channel 47. Only recently did he finally relinquish that responsibility to Horizon owner Susan Daniels. Rather than socializing, “Andrew’s life revolved around his computer and movies,” Robbins noted. “At times, I am nearly a hermit,” Andrew confirmed. Surviving Andrew are his brothers Billy, Nathan, and Barry Schultz. His father Leon Schultz died in 1990 and his mother Fran in 2000. Editor’s note: At Andrew Schultz’s request, several of us combined efforts to write this piece before he died. In contrast to the controversy raging in town and in the press this week over the sorry state of The Point Reyes Light under its new publisher, life has remained fairly bucolic at my cabin. 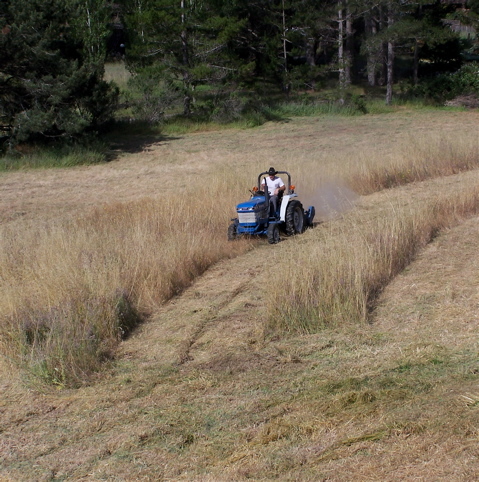 In preparation for the fire season, tractor operator Gary Titus from Tomales on Saturday mowed my pasture and that of my neighbors Dan and Mary Huntsman. Homes uphill from fields of dry grass are particularly vulnerable to wildfires, county firefighters remind West Marin residents each summer. Titus, who mows our pastures annually, told me that ours — like other fields he’s mowed this year — were faster to cut than usual even though the grass was higher. It apparently has to do with which types of grass grow best as the timing and amount of rainfall vary. The mowing provides quite a show, for crows continually fly in circles around the tractor looking for insects, snakes, and other small creatures killed — or at least stirred up — by the mowing. It is not uncommon for West Marin’s ubiquitous gopher snakes to get chopped up by mowers, but Titus was happy to report that this year he hasn’t killed a single snake. Most of the wildlife around my cabin have, of course, not been affected by the mowing. 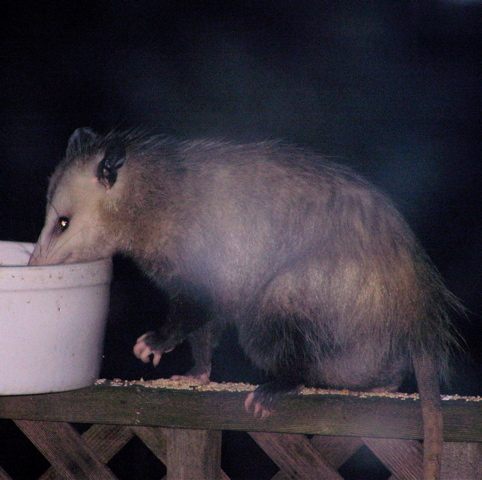 Possums at night still climb lattice to drink from the birdbath on my railing. 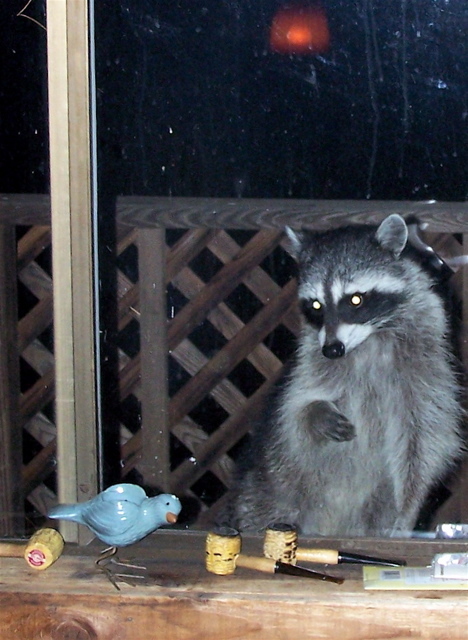 And the raccoon that my stepdaughter Anika photographed last month peering in my dining-room window is back at it. Standing on my firewood box outside, the raccoon (which appears earlier on this blog) initially seemed to be merely checking on what those of us inside were doing. This week when I spotted her again, however, the raccoon had more on her mind. On my window ledge is a ceramic candlestick with the lifelike shape of a small bird. The raccoon obviously wanted to grab it, but there was a pane of glass in the way. In contrast to the rural tranquility around my cabin, protesters in Point Reyes Station milled around in front of The Point Reyes Light Monday morning. Some were upset by the paper’s sensationalism, which which under publisher Robert Plotkin has been heavy on gratuitous gore. Others complained that the newspaper no longer provides West Marin with the coverage it needs. “It’s lost connection to the community,” protest organizer Elizabeth Whitney of Inverness told the press. The demonstration, which got advance coverage in Saturday’s San Francisco Chronicle and by the Associated Press, was covered live on Monday by Sonoma County public radio and the Santa Rosa Press Democrat. Payne also interviewed Joel Hack, owner of The Bodega Bay Navigator website, who plans to launch a competing weekly newspaper in West Marin on July 5. The new paper has been temporarily dubbed The West Marin Pilot until readers chose a final name, and Hack last week told The Chronicle that scores of people have begun subscribing before the paper even exists or has a definite name. He has also reported significant success in lining up advertisers. Notwithstanding the protest and a new competitor, The Light itself got some good news this week. Missy Patterson, who runs the paper’s front office, has changed her mind and will not work for the new newspaper, Hack reported. He said Patterson did not explain her reasons in detail, mentioning only that she was uncomfortable with her earlier decision to jump ship. And on Wednesday, The Independent Journal reported that former Light bookkeeper LaShanda Goldstein has pled guilty to embezzling $62,000 from the weekly. Goldstein, 29, of Santa Rosa remains in Marin County Jail in lieu of $62,000 bail, The Independent Journal added. In the year and a half since Plotkin bought The Light, the paper has dropped most coverage of West Marin’s local-government and school-board meetings while adding a smattering of news from Sonoma County, East Marin, and San Francisco. Also offending numerous demonstrators was The Light’s new sensationalism, such as photos of a girl biting into the severed head of a goat on June 6, 2006 (666 supposedly being the symbol of Satan) and large, color photos of blood draining out of dying chickens that are hanging upside down with their throats slit. 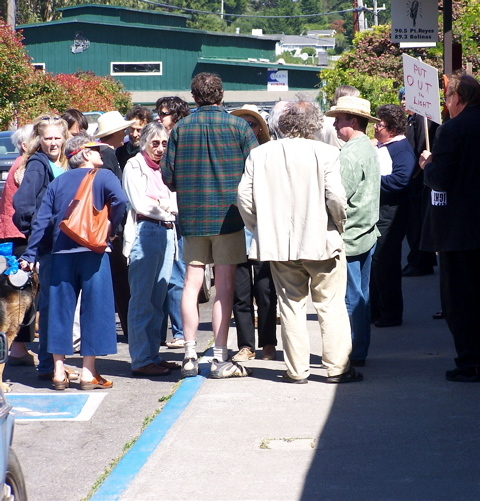 The protest, which was organized by Elizabeth Whitney of Inverness, was called “Take Back The Light,” and some demonstrators brought copies of The Light to return. Historian Dewey Livingston of Inverness (in cutoffs with back to camera), who has quit writing for The Light, arrived with a copy of The Light’s quarterly Coastal Traveler. The same issue contained an enticing photo of a girl in a swimsuit wading out into Nicasio Reservoir, which is illegal in the drinking-water supply. The photographer was Plotkin. 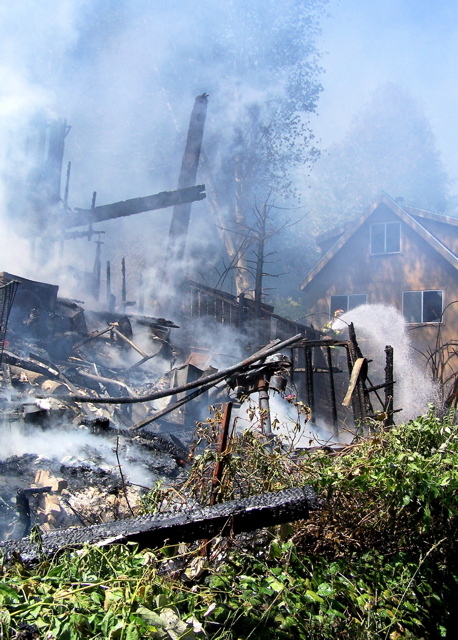 A 2,000-square-foot art studio at 80 Blackberry Way in Inverness Park burned to the ground Friday afternoon. The owner, Sherburne Slack, whose home is next to the studio, told me while the fire was still burning that he had “no clue” as to what started it. Slack noted he gone to the studio half an hour before the fire broke out and had seen nothing amiss. There are no fire hydrants on Blackberry Way although there is one not far away at the foot of Balboa Avenue where tanker trunks refilled. Slack (above) has a 3,000-gallon tank at his house, from which both he and firefighters also drew water. 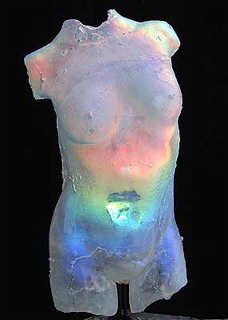 The studio was being used for sculpting and had previously been used for blowing glass, but none of the glass furnaces had been turned on in a year and a half, Slack said. 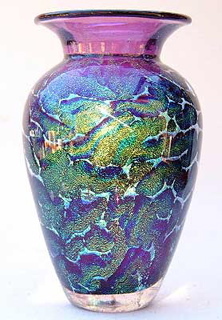 The artist explained he had developed a bad back and could no longer handle the heavy lifting glass blowing requires. Slack said he lost $50,000 to $60,000 (wholesale price) of art in the blaze. Slack’s art (left) has been exhibited worldwide. Some of it is currently in an exhibition in New York, he noted. The artist said he had been working at a computer in his house and waiting for someone with a brush chipper when he heard noises and went outside expecting to see the chipper. Instead he found smoke billowing from his multi-level studio less than a block from Balboa Avenue. Slack (at right) said he immediately called the 911 emergency number but was kept on hold for six minutes. Meanwhile neighbors called the Point Reyes Station firehouse directly, and one person drove into town to alert firefighters. Firefighters were called out at 2:18 p.m. County firefighters from Point Reyes Station, Woodacre, and Tomales responded, as did the Inverness Volunteer Fire Department. 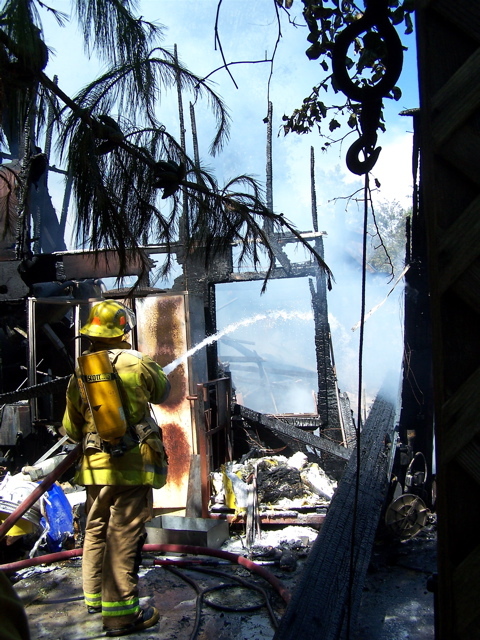 When firefighters arrived on the scene, a prime concern was preventing the blaze from spreading to a house next door owned by Bolinas School teacher Don Jolley. Although the Jolley house (above) did not catch fire, heat from the blaze blew out windows facing the studio. As of this posting, the county Fire Department was preparing to look for clues as to what started the fire. Slack told me the studio was uninsured, adding that he does not have enough income to rebuild it. However, he said, the loss was just “stuff” and that it was more important that no one was hurt. The glass torso above, which also comes from the studio, is titled “Resurection.” Both pictures of Slack’s art were taken from sherb.com where more of his work can be seen. Immediately after Saturday’s Western Weekend livestock show and immediately after Sunday’s parade, I published unscheduled postings on the events. 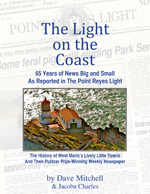 Also covered were the contemporaneous debut of The West Marin Pilot and The Point Reyes Light’s reporting that it had lost $62,000 to an allegedly embezzling bookkeeper. 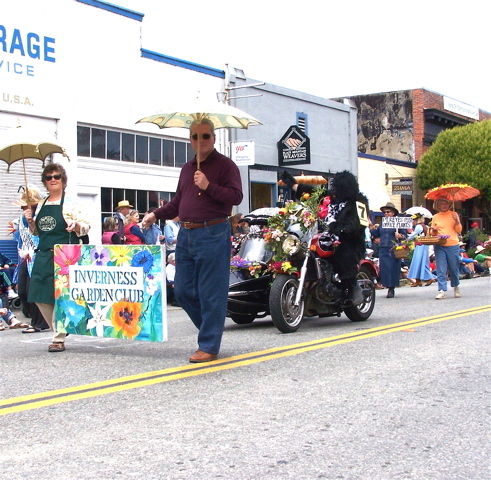 The Inverness Garden Club as always was one of the more colorful entries in Sunday’s parade. What made the entry particularly unusual this year was the driver of the motorcycle with sidecart that typically is part of the entry. 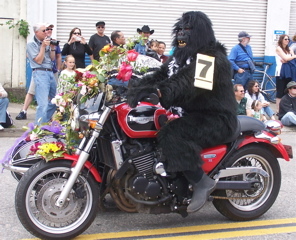 This year the driver, Terry Aleshire of Inverness, wore a gorilla suit although his motorcycle was decked out in flowers. The incongruity was pure theater, and spectators loved it. 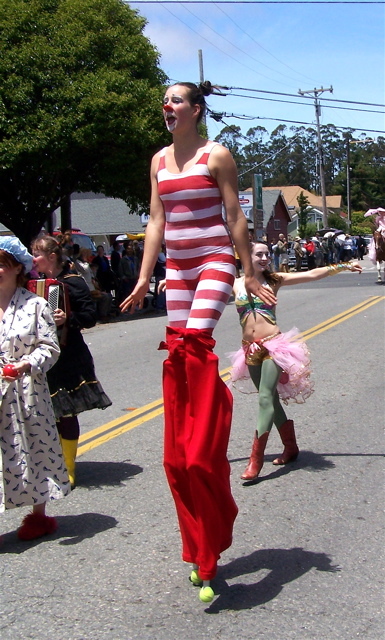 A stilt-walker from Circus Finelli managed to gracefully navigate Point Reyes Station’s main street during Sunday’s parade. After the parade (and without stilts) she, along with the rest of the circus, entertained guests with comic gymnastics at the Farm Bureau Barbecue in the yard of Toby’s Feed Barn. 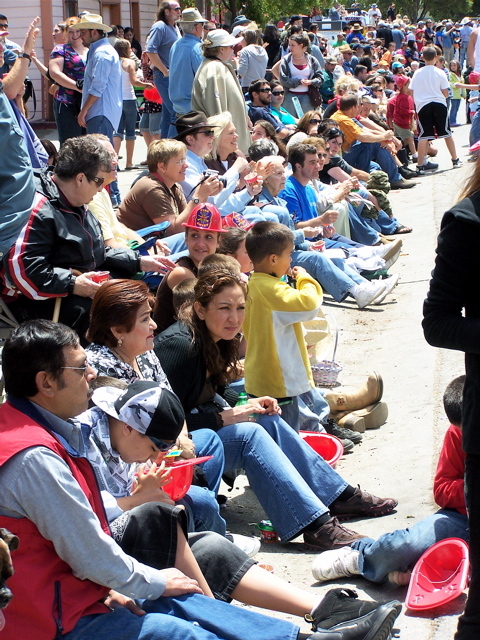 A satire of The Point Reyes Light was distributed to spectators during Sunday’s parade. Although stacks of the spoofs were on store counters around town, nobody seemed to know who produced it. Light publisher Robert Plotkin no doubt can handle the ridicule. He’s probably getting used to it by now. A more significant problem for him was revealed in the May 27 issue of The San Francisco Chronicle. Plotkin has been recruiting unpaid interns to cover the news of West Marin, East Marin, San Francisco, and Sonoma County. In fact, if The Light keeps adding to the number of communities it covers, it may soon try assigning interns to Vallejo, Hercules, and Pinole, possibly along with Milpitas, Coalinga, Brisbane, and “parts” of Tehama County. When I owned The Light, interns were required to live in West Marin during their internships, were paid (typically well above minimum wage), and received gasoline expenses — if they worked three or more days a week. The few one- or two-day-a-week interns we ever used received gasoline expenses but were not paid. It would now appear they should have been paid or — more likely — not used at all since a legitimate internship involves many hours of coaching. But getting back to Western Weekend, here judge Kelsey Cheda of Petaluma FFA appraises junior heifer calves, awarding first place to Elyassa McClure (left), second to Janelle Kehoe, and third to Ben Ielmorini during Saturday’s livestock show. More on dairy cows. Chileno Valley journalist Ivan Gale, who now is a business writer for The Gulf News in Dubai, passed through West Marin last week en route to an airline conference in Vancouver, British Columbia. When I caught up with Ivan, he appeared to be spraying graffiti on a cow at the ranch of his parents, Mike and Sally Gale. In fact, another rancher recently gave the Gales the cow after it fell into a ditch. 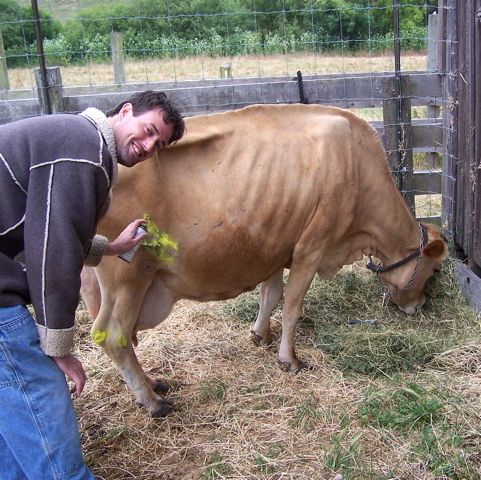 The cow had been slightly injured when it was stuck in the ditch for several hours before being found, and Ivan turned out to be spraying antiseptic on some scrapes. 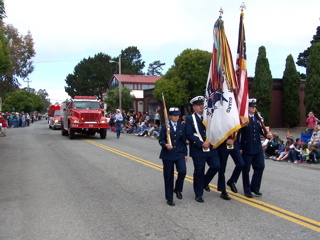 With the traditional lasso twirling and the Coast Guard color guard’s precision marching, Sunday’s Western Weekend parade drew roughly 2,000 spectators, who lined the sidewalks of Point Reyes Station’s three-block long main street. Of course, back in 1980 and 81, the parade drew crowds of 10,000 people, largely because participating groups came from all over the San Francisco Bay Area. But that large a multitude in a town which then had about 600 residents was overwhelming. Rowdy motorcyclists roared up and down the main street when the parade ended. Beer flowed in the gutters. 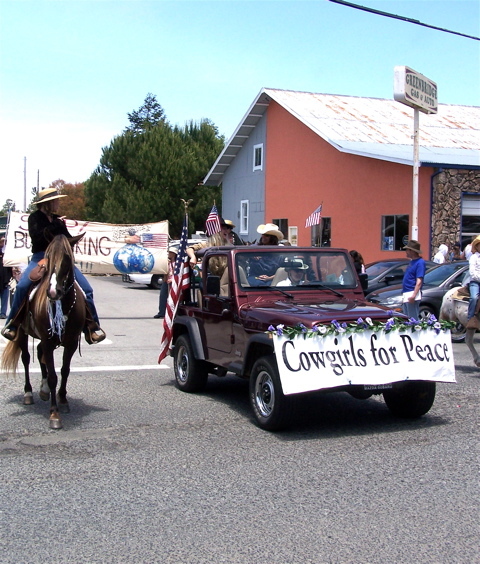 When parades resumed in 1984, they were smaller, home-grown affairs. Which from a spectator’s point of view, not to mention public order, is far more comfortable. Of course, there’s still plenty of spit and polish, for Point Reyes is a parttime home for the US Coast Guard Communications Station crew and for Marin County firefighters (seen at rear). One of the odder entries (last seen heading toward the Old Western Saloon) was dubbed “Light ’em if you got ’em.” The bizarre contraption featured a spinning rack of antlers on the front and belched fire from it’s chimney. At times, the “devil” at left would turn up the gas, and fire would shoot higher into the air. Nervous spectactors were relieved when “the devil” — despite his legendary propensity for mischief — did not turn up the gas while passing under any overhead lines. 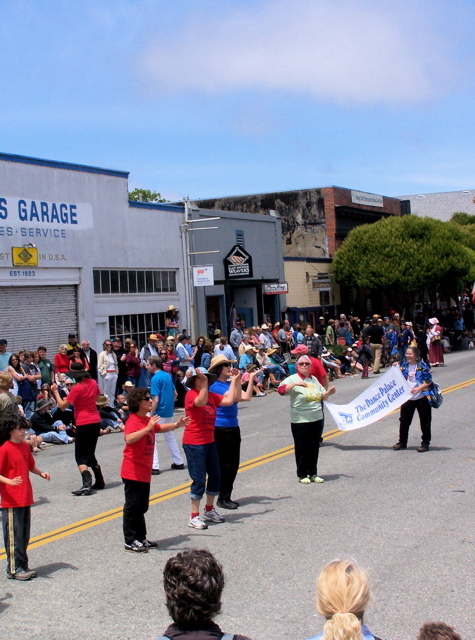 A group from the Dance Palace Community Center danced its way down the parade route. 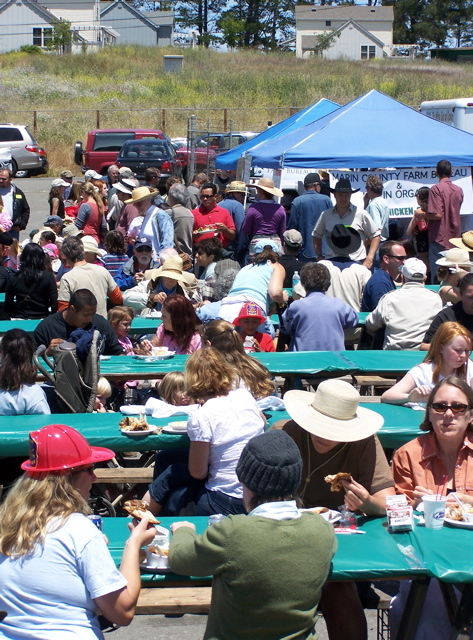 The Western Weekend barbecue, which followed the noontime parade, was sponsored by the Farm Bureau this year and was held at Toby’s Feed Barn instead of at the Red Barn where it traditionally was held. Also moved from the Red Barn this year was the livestock show, and attendance was sparse Saturday. A spot check around town found most people didn’t know it was being held in rancher Rich Giacomini’s corral next to the Dance Palace. Liberty 4-H Club member Danae Burbank (with brown cow) took first in Senior Showmanship (for members 12 and older) in dairy cow judging at the Western Weekend livestock show. 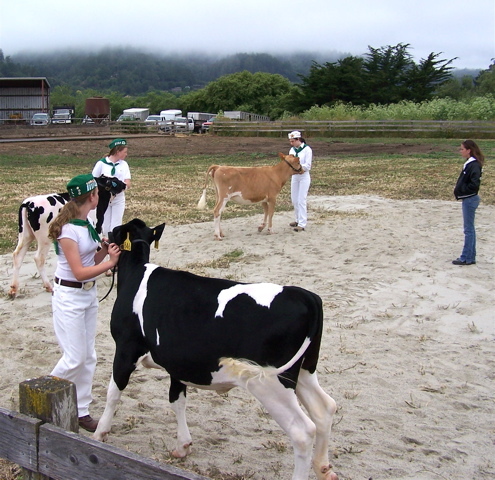 Janelle Kehoe of Point Reyes-Olema 4-H Club (walking behind Burbank) took second, and Michele McClure of Point Reyes 4-H (foreground) took third. Judging their animals was Kelsey Cheda of Petaluma FFA. Cheda is also the dairy queen for District 3 of the California Milk Advisory Board. 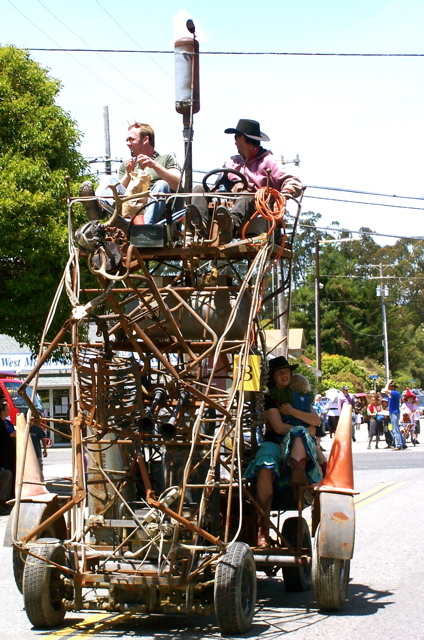 The Western Weekend that got underway Saturday in Point Reyes Station was strikingly different from the previous 57 celebrations. Some things lost; something gained. 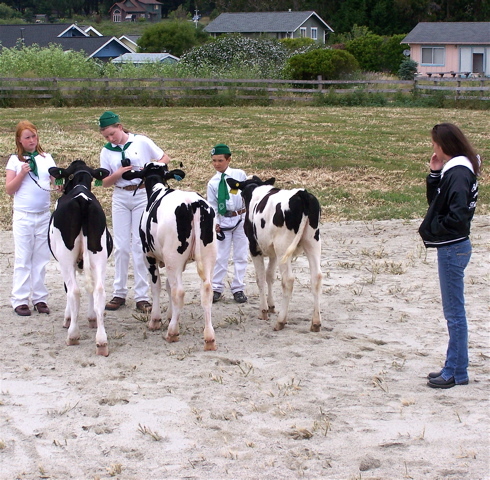 The 4-H club members showing their cows in the opening livestock show, however, were as serious as ever. 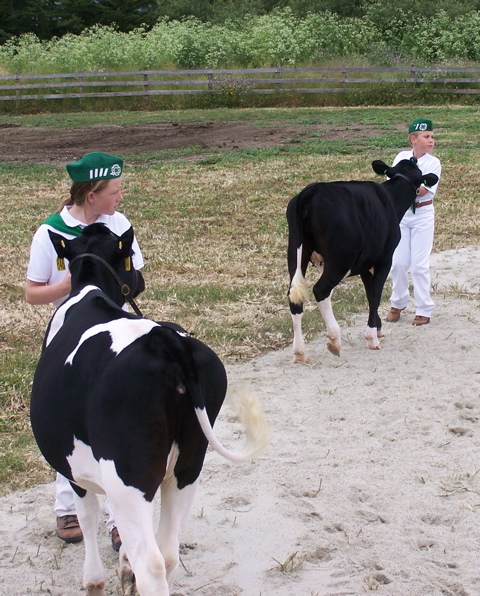 For weeks, 4-H’ers have been practicing showmanship: how to maintain poise while leading a sometimes-recalcitrant cow around a ring, how to groom it for competition, how to make it stand correctly for inspection (which includes keeping one hind leg well behind the other), and much, much more. One youth was penalized when he could not tell the judge the exact date of his heifer’s birth. Michelle McClure took first in senior Holstein heifer competition, and Nathan Hemelt took second. Both belong to Point Reyes-Olema 4-H Club. Despite the extensive preparations that went into the livestock show, far fewer people showed up than in previous years. 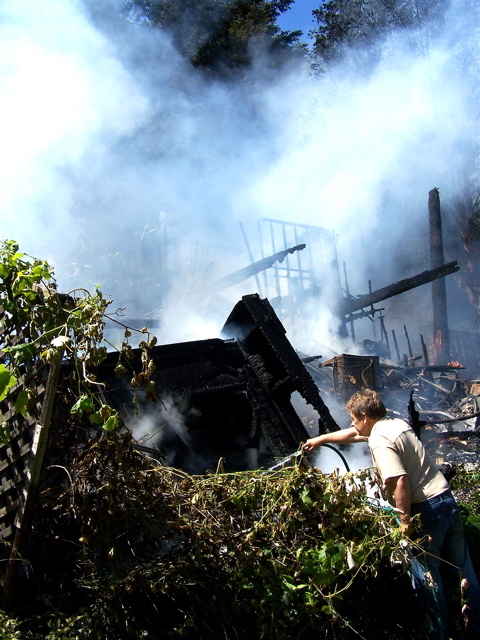 Those who did were mostly from West Marin’s ranching community. The light attendance might be blamed on several things: overcast skies, no horseshow this year, no dog show etc. However, when I walked around Point Reyes Station’s three-block-long main street after leaving the livestock show, I discovered what was probably the main reason for the sparse attendance. Nobody I encountered knew that the livestock show was occurring elsewhere in town at that very moment. Remarkable — given how small Point Reyes Station is. 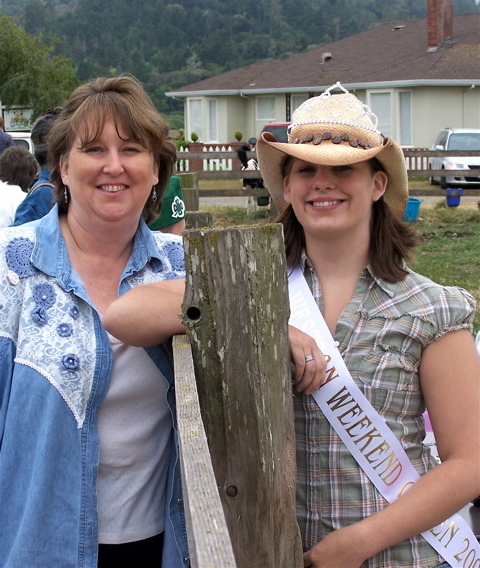 Western Weekend Queen Shelley Schreiber with her mother Patti Collins, manager of the Point Reyes Station branch of the Bank of Petaluma. Schreiber handed out awards to some of the livestock show winners. 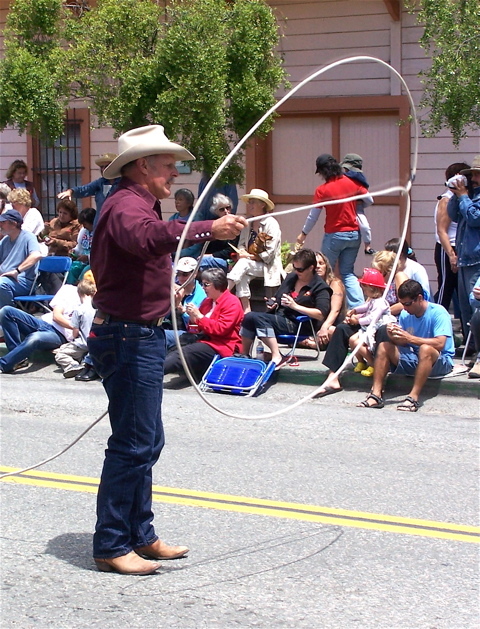 Instead of being held at the Red Barn, as it had been for decades, the livestock show took place in rancher Rich Giacomini’s large corral next to the Dance Palace. The West Marin press has to do a better job next year of letting people know where the livestock show is being held. 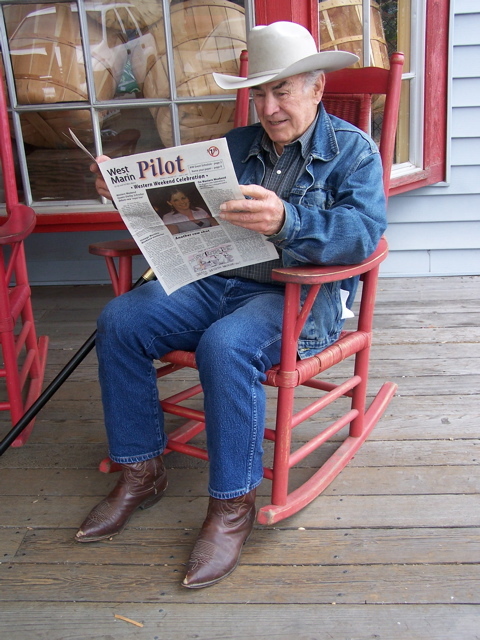 Ed Brennan of Point Reyes Station looks over the new West Marin Pilot while rocking on the porch of Toby’s Feed Barn. Of course, the West Marin press itself was the source of some interesting news this week. The West Marin Pilot published its “Volume 1, Number 0.9” issue on Friday. The odd number of the issue reflects the fact that the paper won’t begin regular editions until the first week of July. And by then, the weekly may have a new name. The introductory issue, which describes itself as “of, by, and for West Marin,” asks readers to suggest a permanent name. 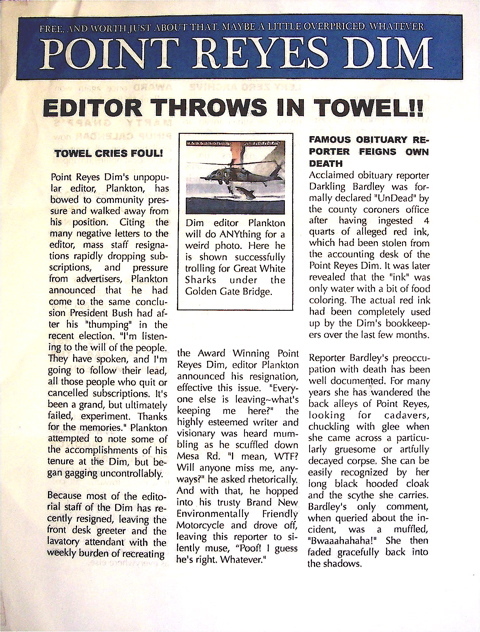 Much of The Pilot’s staff — editor Jim Kravets, office manager Missy Patterson, advertising representative Sandy Duveen, historian Dewey Livingston, obituary writer Larken Bradley, and cartoonist Kathryn LeMieux — worked for The Point Reyes Light when I owned it. That fact has prompted a comment on this blog from Jan Tacherra, who suggests the new paper be called The Pilot Light. Point Reyes Light owner Robert Plotkin wrote in this week’s issue that his former bookkeeper Lashanda Goldstein was charming all the time she was allegedly embezzling from him. Meanwhile, The Light on Thursday confirmed what The Marin Independent Journal had reported May 26; a former bookkeeper has been arrested on charges of embezzling $62,000 from the newspaper. The arrest came almost six months after a credit card company alterted Light owner Robert Plotkin to what allegedly turned out to be $23,000 in fraudulent use of the paper’s account. The bookkeeper, who went to work for The Light in June 2006 as Lashanda Lewis, later that summer married Marty Goldstein and became Lashanda Goldstein. Just the champagne for her wedding probably cost $800, for among the charges on the company credit card last August was $800 for champagne. When the charge was first noticed in January, Goldstein initially claimed I made the purchase. After I pointed out I had cut up my copy of the company credit card in front of Plotkin when I turned the paper over to him in November 2005, Goldstein suggested the purchase must have been made by her predecessor, but that didn’t hold up either. 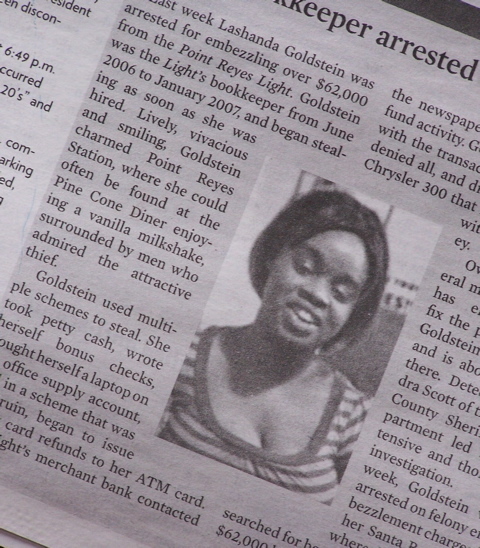 Goldstein is alleged to have embezzled for everything from household expenses, to a laptop computer, to a new car — using the company credit card, writing checks to herself, and stealing petty cash, The Light reported. In The Light’s account, which was written by Plotkin, he reported Goldstein was “lively, vivacious… and charmed Point Reyes Station.” Some of Plotkin’s staff, however, considered her more obsequious than charming. They have told me she put in short hours, failed to perform significant duties of the bookkeeper’s job, but continually fawned over Plotkin. Sparsely Sage and Timely is powered by	WordPress 4.9.10 and delivered to you in 0.337 seconds using 39 queries.